Sheri Burke and Dr. Adan Oliveros, in the new clinic for infertility treatments in Cancun, Mexico. Allow International Patient Facilitators to give you a tour of our state of the art IVF Center in Cancun, Mexico. We organize all the details for IVF couples visiting Cancun and Dr. Adan Oliveros for treatment. 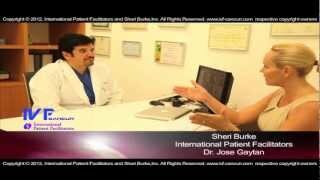 This interview with Dr. Jose Gaytan and International Patient Facilitator's Sheri Burke discusses Dr. Gaytan's education, his views on success rates in IVF patients under and over 38 years old, the medications he uses and the technology used at the Fertility Center Cancun. Sheri Burke and Dr. Adan Oliveros, in the new clinic for infertilty treatments in Cancun, Mexico. 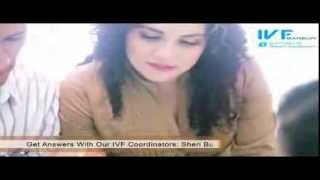 Allow International Patient Facilitators to give you a tour of our state of the art ivf center in Cancun, Mexico. We organize all the details for IVF couples visiting Cancun and Dr. Adan Oliveros for treatment. International Coordinator, Sheri Burke gives us a tour of the FCC - Fertility Center Cancun and gives us a look at the very advanced technology that is utilized at their Center. The Fertility Center Cancun is led by Reproductive Endocrinologist, Dr. Jose Gaytan who is one of the leaders in Fertility Treatments in Mexico.